I just paid a quick visit... very dark and funny (does that make me a bad person?). Incidentally, I've found that your Windlight notecards are working in the latest build of Kirsten's viewer. I don't know if that is a new feature or not, but I didn't realize that it works until I tried opening one of them on a lark. Another excellent work, really beautiful, with feeling, funny, a pleasure for the senses. I loved it, congratulations. Diagnosis: gadgetitis, technologieosous, machine fatigue, etc. Ann's murderous remedies serve as an art action to arms. She prefers the simple "Ann" and she is not into all that gore - her strike is surgical, her weapon - love. Don't be befuddled by these evil times in the whirlwind destructive gyre of post capitalism - the garden awaits. Spill a little oil to anoint the earth and soon her cup runneth over. Bryn it is really a great Art Show! When I saw the room of the "Jury" I I felt like a blow to the heart .. it was a growing from the start to the end.. all my sincere congratulations it is a real masterpiece. Your new build is amazing, once again. With a more funny touch, although it's very dark humor, anyway. This way of moving from one room to another (I prefer to stay vague so that new visitors have the surprise) it's a great idea. Very dramatic effect. I'm also stunned by the attention you gave to the smallest details. We can travel into space, but also into size. It's worth standing for a good while, just wandering with the cam, marvelling at the midget precision machines, or reading the beautiful poems and messages written on tiny sheets. Too sad that so few people take the time to really pay attention. I think I will visit again several times, I'm sure I missed the half, at least. You are amazing!!!! This is the first of your work I've seen & I visited a few other places like the Alice in Wonderland themed sim. Just so great! SL should spend more time allowing artists this creative freedom. It only makes the sim as a whole better. 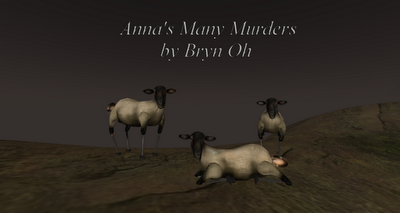 Anna's Many Murders left me feeling inspired; a virtual reality based on such basic real life problems and dilemmas. I left questioning, pondering and imagining. The story takes you on a journey, connecting with you on several levels; reality, fiction, fiction in reality, and reality in fiction. As you can see, your sim really touched me. Every great work needs a main theme that connections all the pieces and i really felt it was seeing Anna turn into butterflies (in prison and standing near the horse.) Its the one truth that anyone who visits the sim can't escape; that hey are participants in escapism observing a story about escapism and a freedom found within. I really hope I didn't just totally over analyze this but i love it! Thank you thank you! Of course my next thought was your region, but your Anna's Many Murders sim just had default sky and water. But the story was great. I was-using an old version of snowglobe untill the fixed the crashing, It took about a month and a half but this version is fine. Halberds inflict higher damage, however are slower. Hatchets are usually swiftly, but poor Buy Runescape Gold. Their own major purpose is for woodcutting. Staffs are available in numerous unique strategies. Elemental staffs, battlestaffs, mystical employees, god employees, as well as slayer staffs. Your elemental employees can discover exactly what aspect you may have endless regarding Buy RS Gold. As an example, for individuals who own a fireplace personnel, you will not will be needing flames runes for you to throw a tap out making use of fireplace runes. Pickaxes are not quite exceptional tools. Thank you! I wasn't sure it was going to be worth it at first. The ext ra work I had to put into it was insane but I am loving the finished product. I'm happy everyone else seems to love it too.